As previously noted here, David and I eat a lot of sweet potatoes. A lot, a lot. Each week I make a big batch, toss them in the fridge, and bring them out for at least a meal a day. I put them in my salads for lunch. They’re on regular rotation as a sweet and savory side in my husband’s lunch bag. And dinner doesn’t feel quite complete without a few sweet gems on the side of my plate (drizzled with sriracha, of course). Recently bestowed with the super coveted “super food” designation, the humble, affordable, and nutrient-rich sweet potato has taken over our plates! If the average American eats just over 6 pounds of these naturally sweet and delicious tubers each year, the Gollinger family probably eats four times that many. And I don’t feel bad about it either. I always used to walk away from a plate of pillowy, greasy fries sick to my stomach, literally and figuratively. 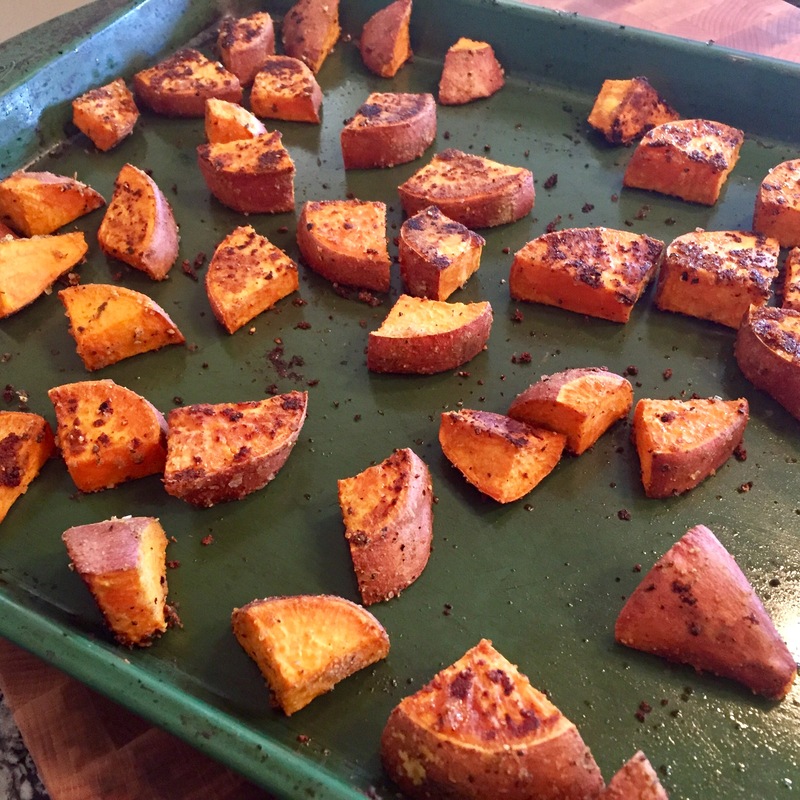 It wasn’t until we made the commitment to a Paleo lifestyle as an effort to alleviate some of my husband’s autoimmune symptoms that we also made the switch to sweet potatoes and started to feel a whole lot better. I won’t jump on the all-starchy-white-foods-are-bad train because I generally think that any food grown in the ground should have a place on your plate. However, I do firmly believe in the principle of using food as medicine. The dose and frequency may vary by person, especially in those suffering from autoimmune disorders or other gastro-intestinal issues, but generally speaking, non-processed foods are going to get you from sick to healthy a whole lot quicker than a fast food burger and fries. So why do we eat so many damn sweet potatoes?! Believe me, I asked myself that too every day for about the first year. Giving up dairy wasn’t nearly as hard as I thought it would be. Incorporating a little more protein was a cinch. But giving up bread and eating sweet potatoes on the regular reeeealllly challenged the foodie in me. While I still occasionally find myself wistfully sniffing the air of the bread aisle almost two years later, I’m proud to report that I’m firmly on Team Sweet Potato these days. I’ve come up with a dozen or so ways to make them work into every type of meal. In fact, I was shocked I’ve only posted about them once here before (check out my spicy, sweet guiltless fries). My latest rift on sweet potatoes mellows the natural sweetness of the vegetable with warm spices like cumin and smoked paprika. The cooking method caramelizes the outside and renders them delectably crispy. Give this nutrient-packed, paleo and AIP friendly superfood a shot, and I promise it will become one of your family’s favs too. Wash and scrub the outside of the sweet potatoes under cool water. Leave the skins on. Dry thoroughly with a paper towel. 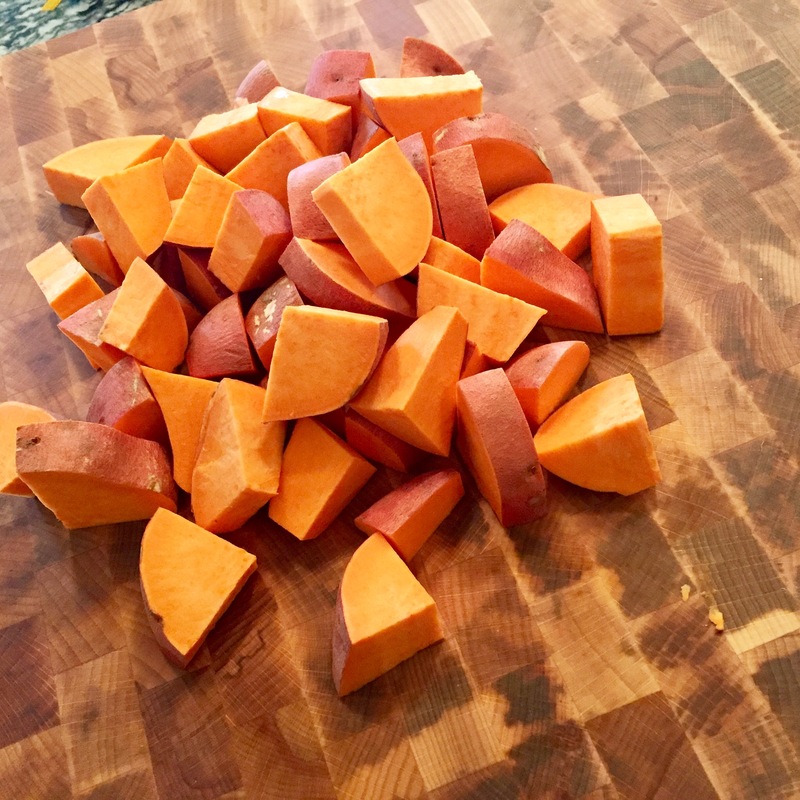 Chop each sweet potato into a 1-inch dice and place on a cookie sheet. Drizzle the olive oil over the chopped sweet potatoes and add all seasonings. Use your hands to toss the sweet potatoes in the olive oil and spice mixture, ensuring that each is uniformly covered. Place in the oven and cook for 20 minutes. 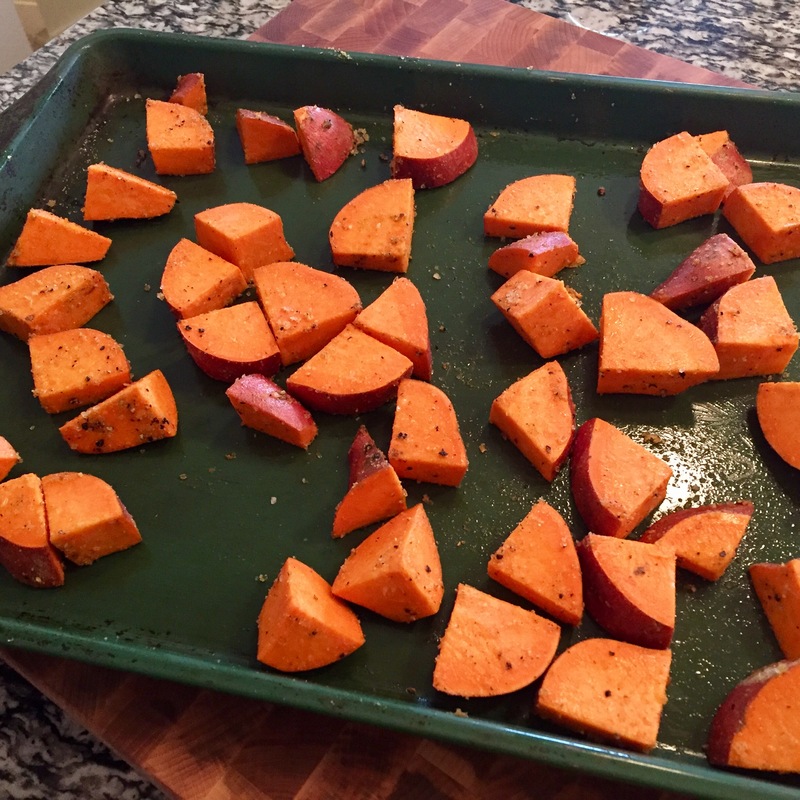 Remove the pan from the oven and flip the sweet potatoes to ensure even browning. Replace the cookie sheet back into the oven for another 15-20 minutes. 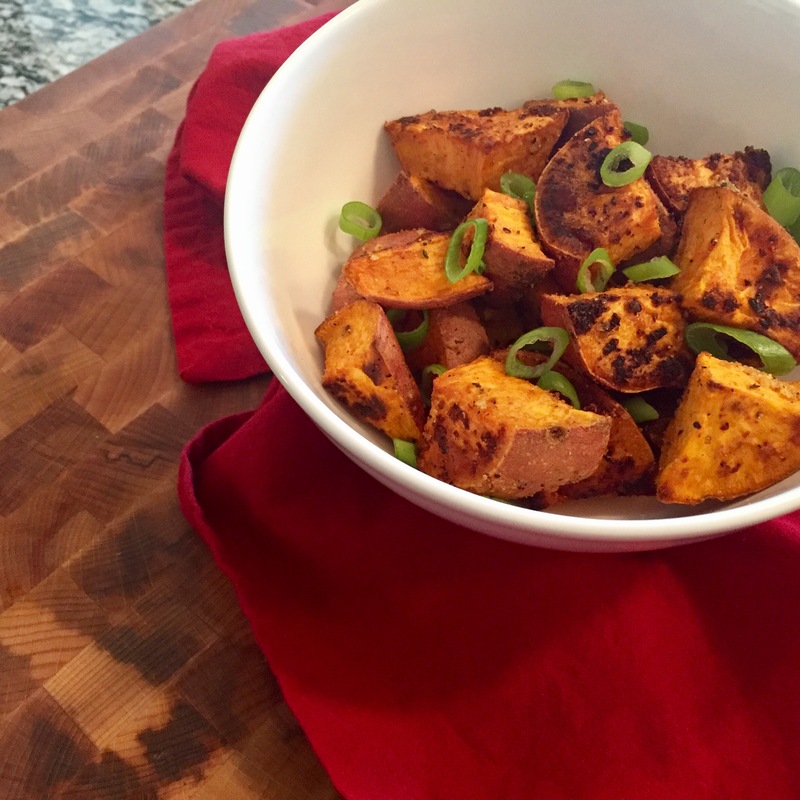 The sweet potatoes are done when they are crispy, brown, and slightly caramelized. Top with green onion tops and/or sriracha. Just wanted to let you know that I made these a few nights ago and they were a success! Super, super easy to make and tasted so delicious that they actually elicited a positive comment from my boyfriend! Whaaaaat??? The man hardly EVER has positive things to say about food here in the states (nothing is as good as what his mama makes in Italy). I nearly hit the floor in shock. I managed to stay upright, though, and happily enjoyed the rest of the potatoes, knowing I’d found a winning recipe. I have a feeling these will become a staple in my house. Thank you!! Hi Ashley! So glad the sweet potatoes were a hit! It feels good to be back!! Thank you for being a loyal reader! Fingers crossed our sweet potato habit get us to triple digits too! Lots of love to you!